If you’re looking for a family weekend movie option, Hotel Transylvania 2 is still showing in theaters near you. The supposedly creepy and scary hotel is back. And yes, it now accepts humans as guests. Dracula had welcomed people since his daughter Mavis fell in love with a Jonathan, a human. The latter’s family had also been welcomed through various occasions including the young couple’s wedding and their son Dennis’ birthday. There’s just one thing missing, Drac, wants to see his grandson become a monster (or in their case, vampire). Dracula’s own dad, Vlad, is also not open to the idea of mingling with humankind as well. But all is well in the end as Vlad eventually accepted humans, even chose to help one and betray his own kind (err… batkind literally but not a vampire). Denisovich, as Drac calls Dennis, eventually showed his vampire side. He is a late bloomer like his grandfather but after seeing his friend Winnie (most likely the youngest amongst the 300 werewolf puppies) hurt by Vlad’s bat servant (yes, a talking human-sized bat), his fangs grew and he was able to transform into a bat. Most of the film’s screen time was spent with Drac and his gang’s attempt to encourage Dennis to embrace his monster side. The movie is hilarious from start to finish. Even eerily dark themes appear very humorous. Say for one, that spinoff or vampire version of the lullaby song Twinkle Twinkle Little Star with the opening lines, “suffer suffer scream in pain, blood is dripping from your brain...” Even my daughter laughs at that, along with most of the kids in the movie house when we watched earlier. I find it partly disturbing that she finds that funny though. Speaking of kids, more than half of the audience who watched when we did were kids, probably with their parents, older siblings, or even nannies. So you can hear them laugh almost about everything in the movie. One of the scenes showing the Drac's gang on a scooter reminds of Dr. Nefario's own scooter in Despicable Me. If you are quite the conservative type for a parent though, be sure to explain every single detail about the film that you think is troubling. Kids are very smart these days though. While we were eating dirt during our younger years, they are already tinkering with their gadgets. I’m sure they understand fairly well that this but a work of fiction. 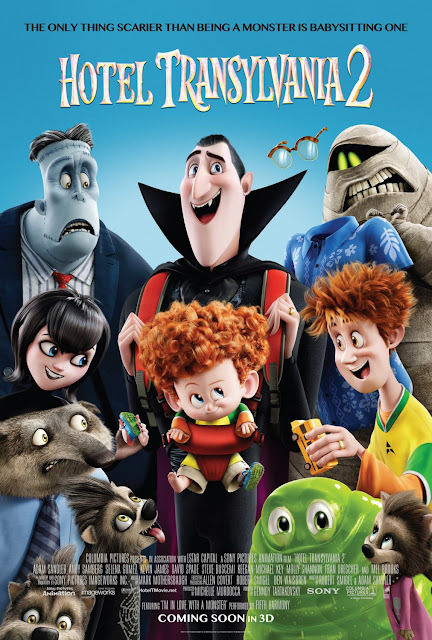 For the rest of the story, plot, production details, cast and more, visit the Hotel Transylvania 2 Wikipedia page.